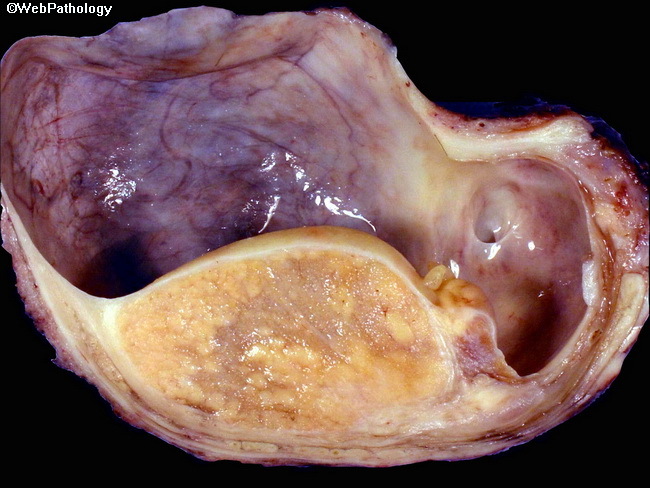 Testis are an uncommon visceral site for metastases from prostate cancer. This gross specimen photograph shows yellow nodules of metastatic prostate cancer against brownish testicular parenchyma. A large hydrocele is also present. Before the availability of chemotherapeutic agents to induce androgen deprivation, patients with metastatic prostate cancer underwent orchiectomy to remove the source of endogenous androgens. Routine examination of such specimens resulted in frequent detection of testicular metastases even though it is a rare occurrence.